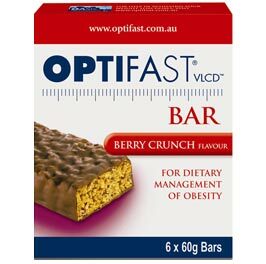 This delicious bar is one of fiffteen products in the Optifast VLCD range and has a fantastic berry flavour and satisfying crunch. It is part of a nutritionally complete Program, is ready to eat and is high in protein and fibre. Directions: Optifast bars are convenient and ready to eat. One bar is equivalent to one meal on the Optifast VLCD program. Contains Milk & Soy. Made on equipment that also processes products containing tree nuts, peanuts and oats. Caution: Optifast VLCD is a food for special medical purposes and must be used under the supervision of a health care professional.